Sometimes you have to go into scary parts of town to eat amazing food. I’ve wanted to go to Jong Ka Jip for a gazillion years, but somehow, never made it. After actually craving soondubu, we made the scary drive. Ok, it’s not really that scary. Just be aware of the red light cameras! And speaking of cameras, don’t worry. The Jong Ka Jip parking lot is well-monitored by at least 4-6 cameras. It was definitely a relief to me. 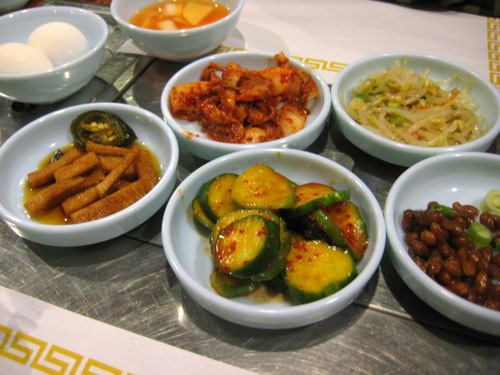 As is standard with korean grub, you get a variety of banchan. None of it was extraordinary here, but it was all ok. I really liked their cucumber kimchi though. So props to you for that, Jong Ka Jip. 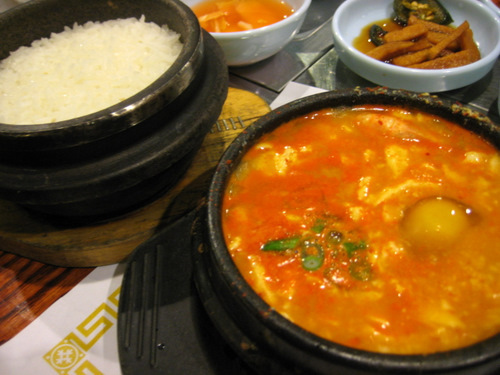 They may have some other things on the menu, but you come here for one thing – soondubu jjigae. It’s a spicy stew with a whole lotta soft tofu, and you can choose what kind of meat, or non-meat, you want in it. When it comes out to you, it’s boiling in a stone bowl. I like to call this a mini cauldron. While it’s boiling, you crack a raw egg into it. 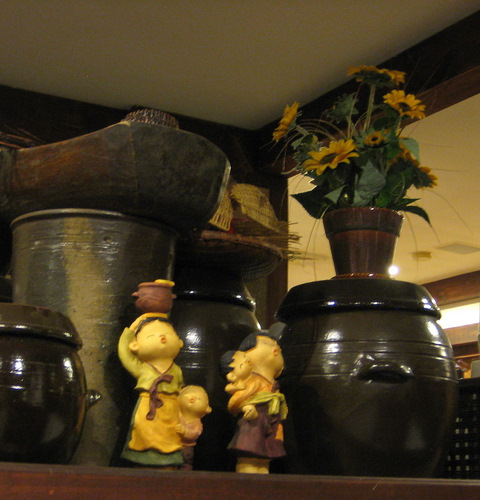 You also get a bowl of rice in a similar cauldron. And you eat the stew with the rice. Easy as pie. And infinitely more delicious. I can’t even tell you how awesome this is. And it’s $9, tax included, free well-lit well-monitored parking lot included, call button included. And when you’re done with your stew and rice, the bottom layer of rice that was exposed to the cauldron will hopefully be a little burnt and toasted. You then pour hot water into this, mix it up, and then eat that. That’s only if it’s physically possible for you to shovel more food into your already distended belly. This food is beyond awesome, super cheap, and more than worth the trek. So do it. I agree with the previous post. My family has lived on the same street as the restaurant for over 20 yrs., before it was a restaurant. Nothing is scary about it. Oh wait. It is very quiet once all the neighbors are in bed at night because they get up early for work the next day. I guess that’s what makes it scary. A quiet neighborhood in Philly. We don’t want you here. This is a diverse, eclectic, low-crime neighborhood. I guess you saw too many black people and assumed it was “the hood”… far from it. Keep your snide remarks and prejudices to yourself.